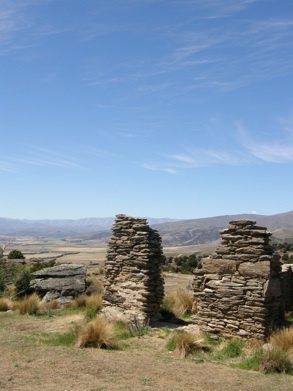 Welshtown Ruins, Bendigo Scenic Reserve, New Zealand. Wildpure honeybee and bendigo kanuka flowers. New Zealand is renowned for Manuka Honey. The manuka bush (Leptospermum scoparium) has a close relative called kanuka (Kunzea ericoides). Manuka is found in wetter, warmer areas than kanuka. Kanuka honey is a lighter colour than manuka honey, but with a similar strong flavour. 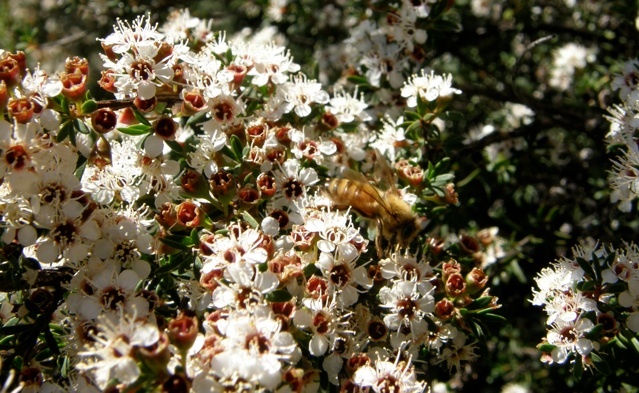 Kanuka honey is a much more scarce honey variety than manuka as kanuka bushes seldom grow as a monoculture separate to manuka plants. Here in Central Otago, we are fortunate to have one of the largest areas of pure kanuka plants in New Zealand. This area is protected by the NZ Department of Conservation (DOC) as a scenic reserve. Wildpure is lucky to have a special concession to produce kanuka honey from within the Bendigo Scenic Reserve. This is New Zealands’ only commercially available Certified Organic Kanuka honey. This honey will be available in a few select gourmet stores from late 2011. Check our stockists page for availability. The 2010 vintage has already sold out! The flavour of Kanuka honey in quite distinctive from manuka honey. It has a crisp, aromatic butterscotch taste with a delightful clean finish on the palate that will leave the tastebuds tingling! The conditions under which we can paroduce a crop of kanuka honey from Bendigo are very specific: not too dry, not too wet, warm temperatures in early summer, and an absence of competing wildflowers for the attention of our bees. This makes Wildpure Kanuka one of the true artisinal honeys!